Congratulations to Zack Ledford on his promotion! Congratulations to the following employees on their promotions! 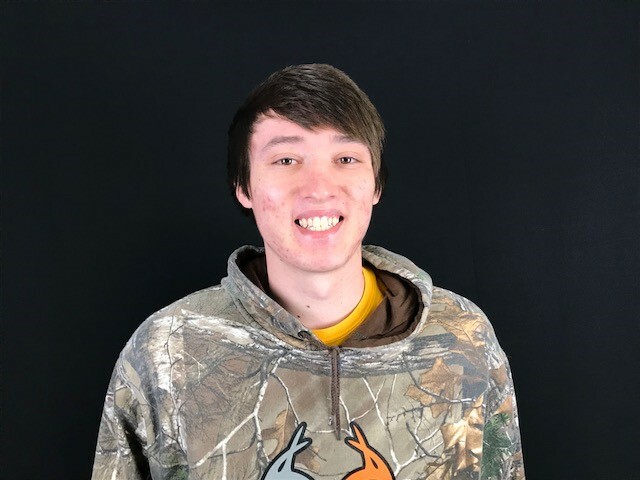 In our Seventh edition of our Series of Summer Intern posts, we introduce Ethan Williams, an Automation Engineering Technology student at Hutchinson Community College. Ethan is from Arlington, KS. 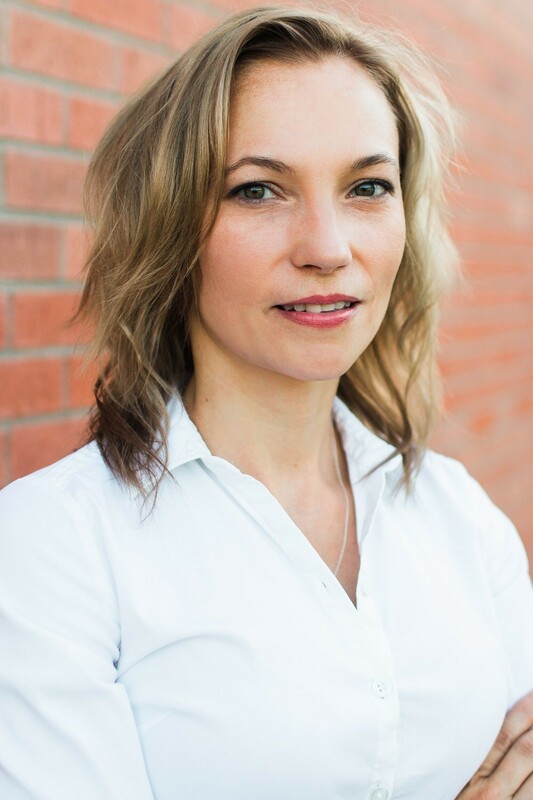 Congratulations to Maria Pressnall, HR Director at Bradbury, for being recognized as one of this year’s top HR Professionals in the Wichita area by the Wichita Business Journal! 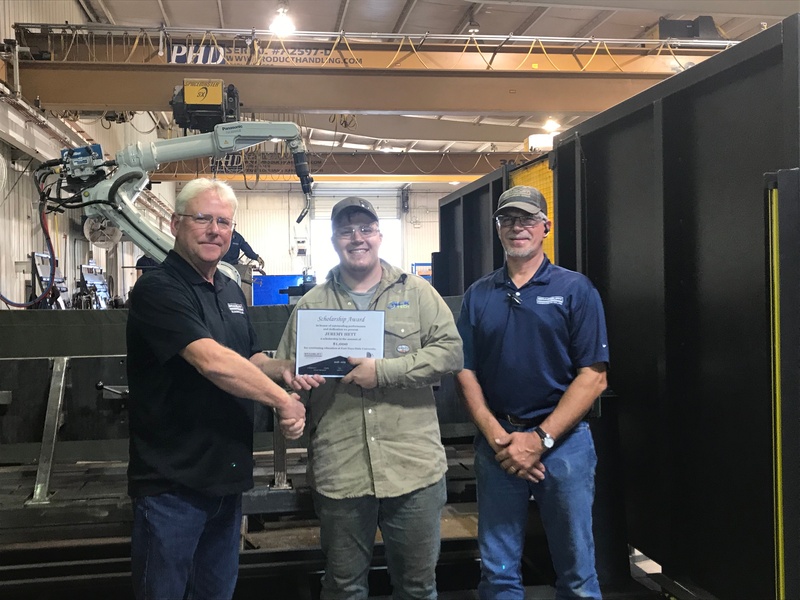 The Bradbury Co., Inc. was proud to present Jeremy Hett, Weld Intern, with a scholarship today. Jeremy will be attending Fort Hays State in the fall to pursue his Associates in Welding Technology. Jeremy plans to intern with us again next summer. We hope to start a tradition of awarding a deserving intern a scholarship each year to acknowledge his or her outstanding performance. Jeremy said that he really appreciates the recognition of his hard work. Congratulations, Jeremy! 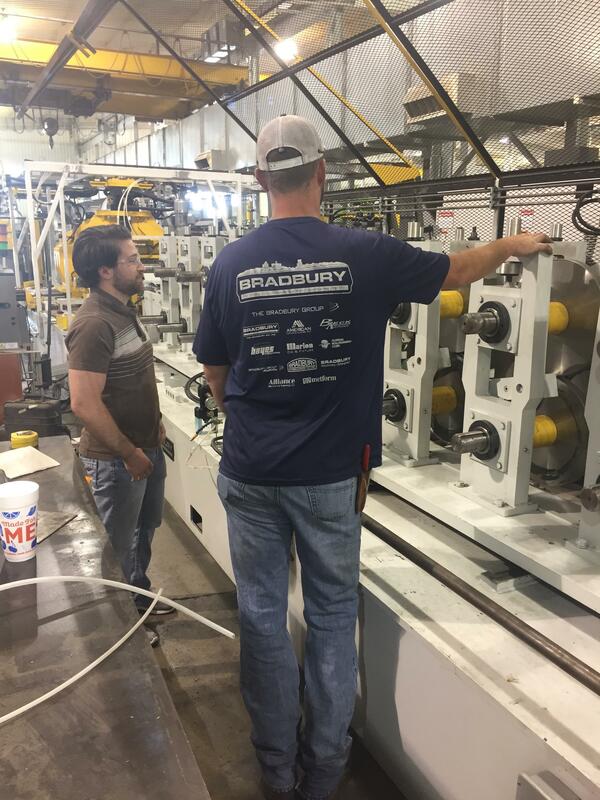 In our sixth edition of our Series of Summer Intern posts, we introduce Austin Bickel, a Mechanical Engineering student at Kansas State University. Austin is from Buhler, KS but currently lives in McPherson. This is Austin's First summer working at Bradbury, but he did spend time with us this winter. Austin has been tasked with working half of his summer in the Assembly Department and the other half in Engineering. He has learned different assembly processes, as well as the engineering applications in assembling machines. Some engineering applications include, reading and interpreting engineering prints, finding the most efficient way to assemble, and learning how to improve the process. During his time in the Engineering Department, Austin has been working on a special concept project. He was tasked with designing both inboard and outboard fixtures to form a return lip on a cee purlin to 90 degrees. Part of the project parameters included the criteria of having four different parts be adjustable using pneumatic cylinders, pin locations, and on a centerline. Austin said "this was an extremely fun project and proved itself challenging in trying to figure out the most practical and most cost effective way to be designed". Gary Janzen, Mechanical Engineering Manager, said "The mechanical engineering internship is designed to give interns a feel for what is involved in a career in engineering. 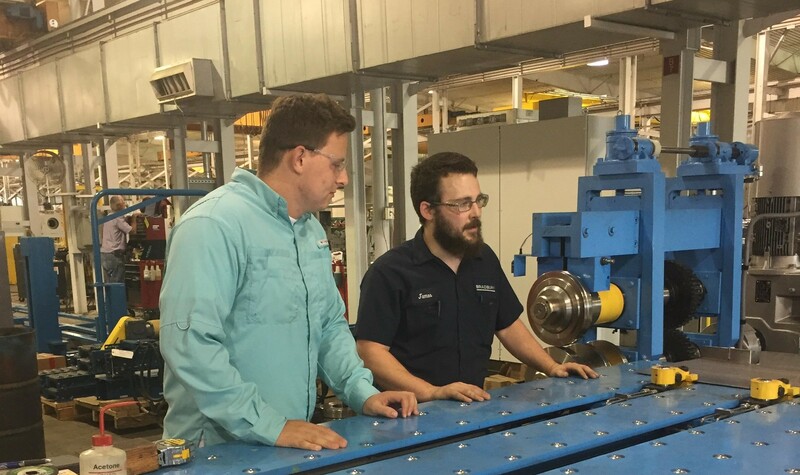 Austin was assigned with the job of designing a roll tooling fixture. Austin has excelled in modeling components along with the required calculation. Austin has a bright future in a career of mechanical engineering." Congratulations to Monte Kimble on his Retirement! 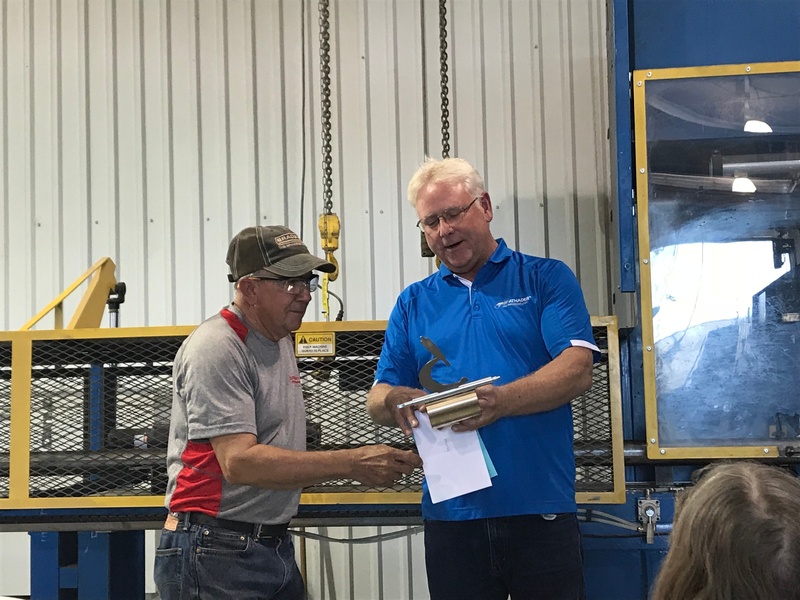 Congratulations to Monte Kimble on his Retirement from Bradbury! Monte started at Bradbury in 2003 where he was a Machine Operator. He later progressed to become the 2nd Shift Team Leader in Plant 1 and then Plant 3. Thank you, Monte, for 15 years of hard work and dedication! We hope you enjoy your retirement fishing on the lake! 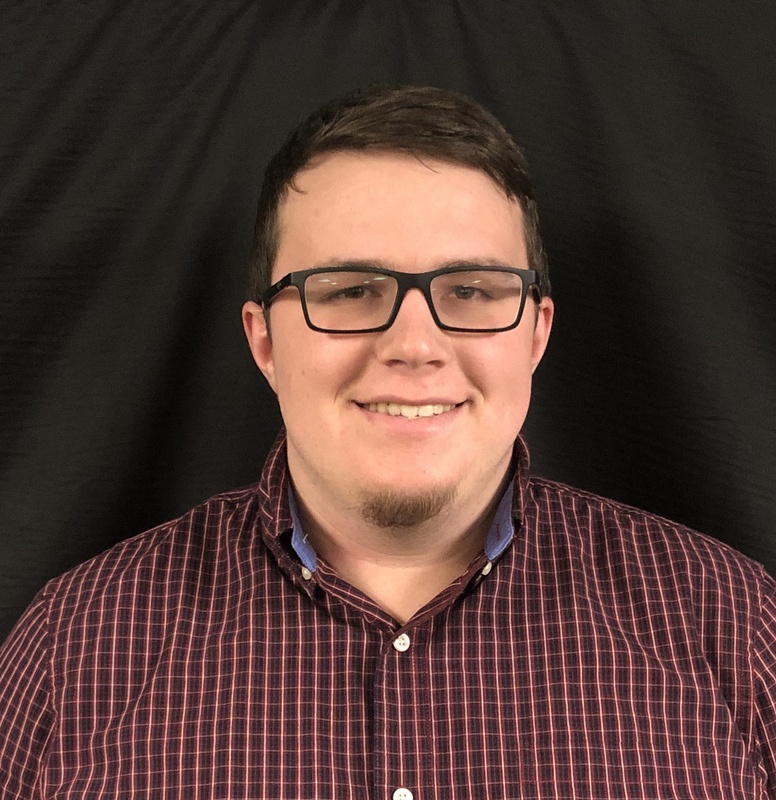 In our fifth edition of our Series of Summer Intern posts, we reintroduce Cade Papes, a Mechanical Engineering student from WaKeeney, KS that currently lives in Wichita and is attending Wichita State University. This is Cade's second summer working at Bradbury. This year, he has been tasked with working on a Garage Door project. In this venture, he assisted other engineers with certain design elements, updated drawings, and completed a report compilation. He was also given a mock project of his own once the first project was completed. The task was to design his own rollformer and perform a stress analysis based on the specifications given to him by his supervisor, Gary Janzen. Cade will continue to work for the company part-time in the fall while he works to complete his degree in December. Gary Janzen, Mechanical Engineering Manager, said "The mechanical engineering internship is designed to give interns a feel for what is involved in a career in engineering. Cade has excelled in modeling components along with the required calculation. He has a bright future in a career of mechanical engineering." 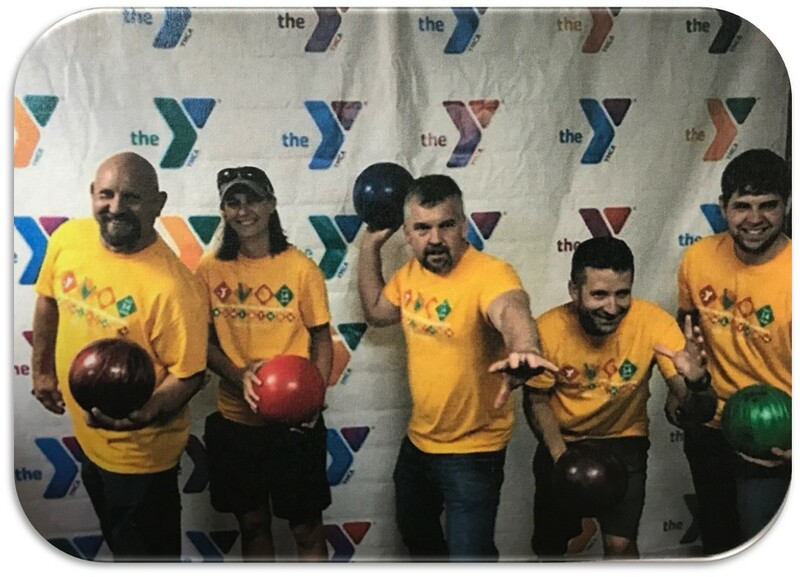 The Bradbury Bowling Team was happy to participate in the 2nd annual Newton YMCA Bowl-A-Thon event in July. The tournament took place at Eastgate Lanes in Newton, where over 50 bowlers came together to raise $10,800 for the Strong Community Campaign. The fundraiser helps "provide life changing programs like SPLASH, Livestrong at the YMCA, Job Prep, Middle School-After School, Late Night, and income-based financial assistance for memberships" as Julie Colborn of the Newton YMCA states. We look forward to participating again next year!